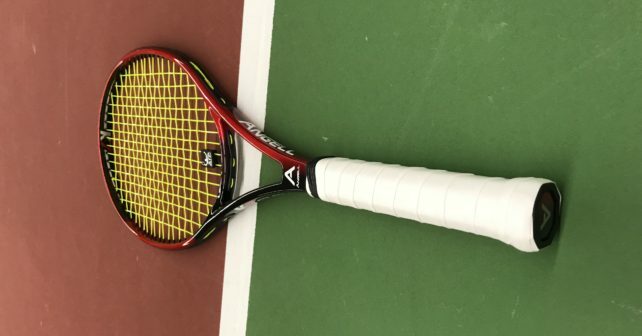 There’s been a lot of hype among racquetholics about the new Angell K7 Red racquets that is Angell’s venture into the “commercial” racquet market. But how good is it? I’ve been using the Angell K7 Red for a couple of hours and I can already say it is one of the most impressive releases of 2017. It’s simply in my mind a more comfortable version of the Babolat Pure Strike and the Wilson Blade 98. I thought it would be pretty powerful, but the Angell K7 Red is a control racquet with a focus on arm comfort. Is it the mix of Aramid and Carbon Fibre that creates this very comfortable frame? 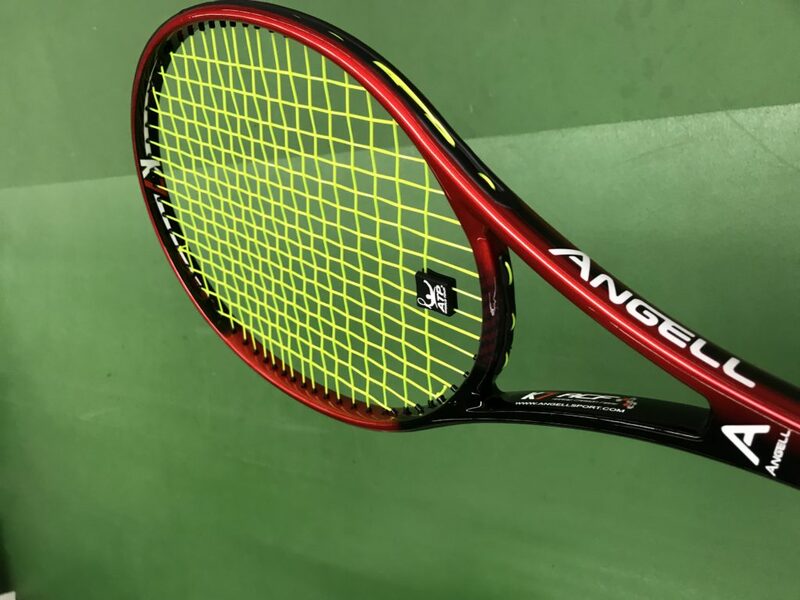 The Angell K7 Red is not foam-filled like the Angell Custom 97 racquets, but to me it felt equally, if not more, comfortable, than those more traditional racquets. I’ve personally been moving back and forth between this kind of spec (98 sq inches, 16×19 string pattern, 305 grams etc) and a more traditional players’ racquet (95 sq inches, 18×20 string pattern, 325 grams unstrung) and even though I’ve committed to my HEAD Liquidmetal Radical Tours, this is a racquet that could potentially make me move back to this “tweener” style of frame. My issue with the both the Babolat Pure Strike and the Wilson Blade 98 (I preferred the 2015 version over the new Countervail version ) was in the end the stiffness, but with the Angell K7 Red I feel that I get a nice responsive feel while my arm doesn’t feel a thing, which is pretty much exactly what I’ve been looking for. I’m also impressed with the lower launch angle that is more focused on control than spin. This is a great characteristic of the Angell K7 Red, it simply seems to give you what you put into it, which is the kind of features that all tennis players should look for. What is better than a comfortable frame that gives you ample control and spin which at 305 grams unstrung also offers plenty of room for customization? As you can hear, a few hours of hitting with the Angell K7 Red has made me enamoured with the frame and I’ve only played it stock so far. Since I’m used to 350 grams strung, I’m going to try to add some lead to the hoop and see how it plays. But it’s for sure a great start and an impressive product. The closest racquet I can compare it to is the Yonex Ai 98, with the K7 Red being a little more muted (it is also lighter). Great control and touch, decent spin and amazing comfort in an easy-to-use frame. For sure one of the top racquets released in 2017 along with the Wilson Ultra Tour. I strung up my Angell K7 Red with Weiss Cannon Ultra Cable around 23 kg and I think the combo both looks and plays great. Please note that the grip size of the Angell K7 Red runs as little big so it might be wise to order a racquet with a smaller grip than you’re usually playing with. On the other hand, I was fine with my standard grip 3, but for many grip 2 with an overgrip will be better. What are your thoughts around Angell K7 Red? Does it entice you? Please comment below! Which one did you like better, tc97 or K7? Which one has the best feel and comfort? I played with the tc95 16×19 63 RA and with the tc97 16×19. I found the tc97 much more comfortable than the tc95. Given the initial favorable review, the K7’s description as a more comfortable “Pure Strike” type racquet with low launch angle, and the great paint job, I’m intrigued by this racquet. Are there any United States based readers who’ve purchased from Angell Tennis? Are there any significant duties or import considerations? Have you tried Yonex Dual G100 (300g)? Specs of K7 are similar and I wonder how playing characteristics compare? Ditto re Angell Tc100 if you’ve tried that please. Tough question, Paulo! So far, the K7 has really wowed me, but I need a few more hours against really good players with some lead tape added to it to see if it could be a racquet I switch to. The TC 97 Custom is a racquet I could put in my bag any time and take to a tournament. I would say that the TC 97 is more of a traditional frame, while the K7 is a uniquely muted modern “tweener” racquet. It is probably the most comfortable racquet I’ve ever hit with! So if I can still find my targets against high tempo players I might deviate from my Radical Tours. Will update you shortly on this. Wow, this “It is probably the most comfortable racquet I’ve ever hit with!” is quite a statement, so it is really more comfortable than Head Pro Tour 630, Head CandyCane Radical, the prostocks you tried ? Interesting first impressions. I have demo’ed with the TC97 Pro, effectively same frame as the TC97 custom as there a number of reviews commenting on its arm friendliness, however I still suffered from some arm pain playing with it. Did not find it as forgiving when hitting off centre. Now trying the Wilson Ultra tour, nice racquet, but again does not feel quite right for me, so the K7 may be just what I am looking for. Would be interested in your views how this compares to the Wilson Ultra Tour? I need to lug more hours with the Angell to do a 100 % comparison, but the materials of the K7 makes it feel really muted, even with a stiff poly in it. The Ultra Tour is also very comfortable, but I think the K7 has a slightly bigger yet perhaps less precise sweet spot so it is probably more forgiving. I realize I might actually mean for “a modern racquet”, but it really is a very muted and arm-friendly frame with a bigger sweet spot than the Pro Tour 630 and the Candy Cane, however those racquets are more precise when it comes to hitting the right inches on the tennis court. I will soon post an update on the K7 now that I’ve played more with it. Thanks for this review Jonas, I am very tempted to buy the K7, and looking forward to your further comments about it. Best wishes for you and your game in 2018! Keep the reviews and other posts coming. Could you compare power levels of the tc 97 (16×19) and the new K7? Thanks for a very very good site? I would say they’re quite close to be honest, same with the spin. The K7 feels slightly more flexible and comfortable though. Be good if they made a weightier version of this frame/mould, or similar, as I prefer not to mess around with customisation. -with same string pattern as well (why do so many heavier frames go to 18/20? The spin keeps it in (and over net) more than the control you get from the extra strings).